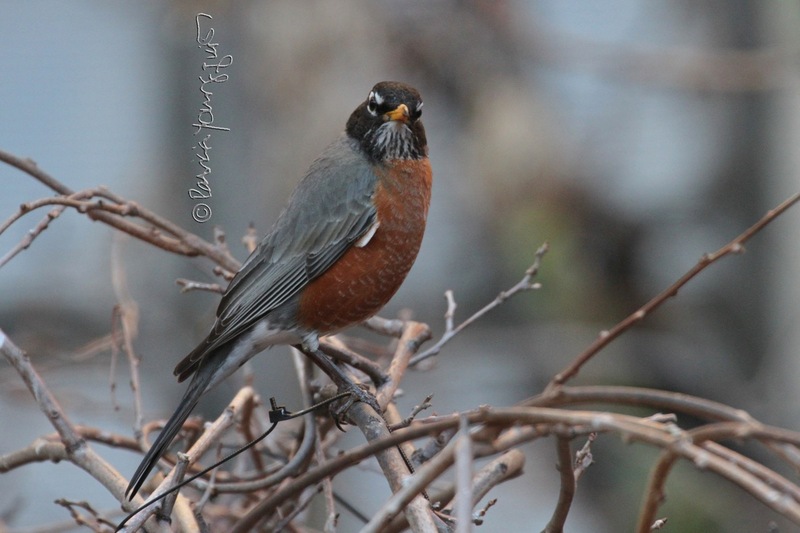 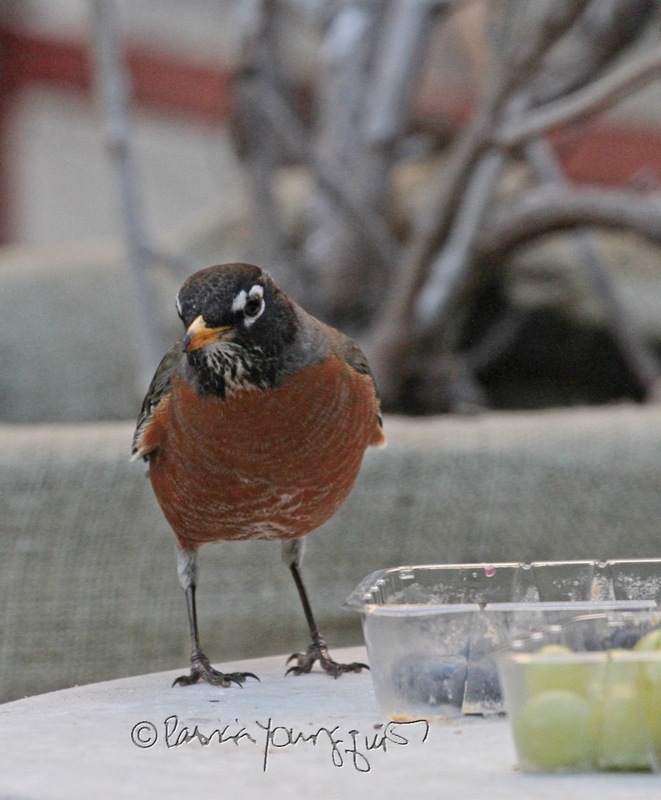 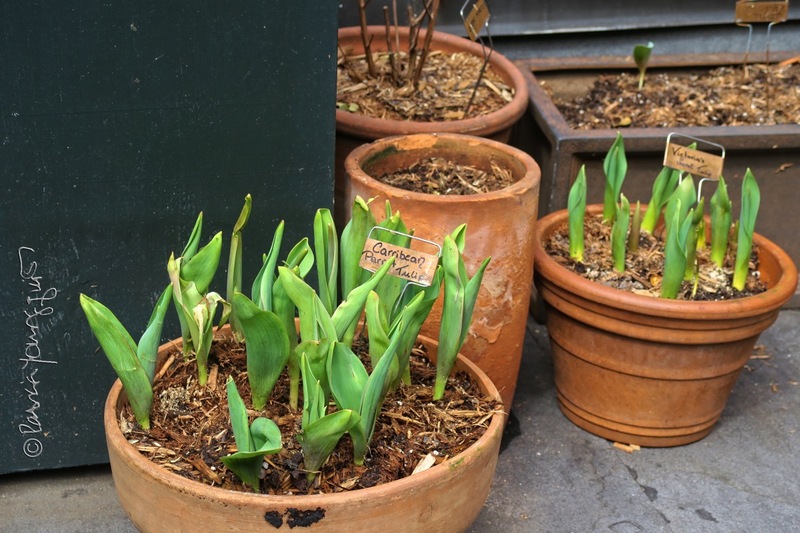 The Last Leaf Gardener: What a DIFFERENCE a week makes! 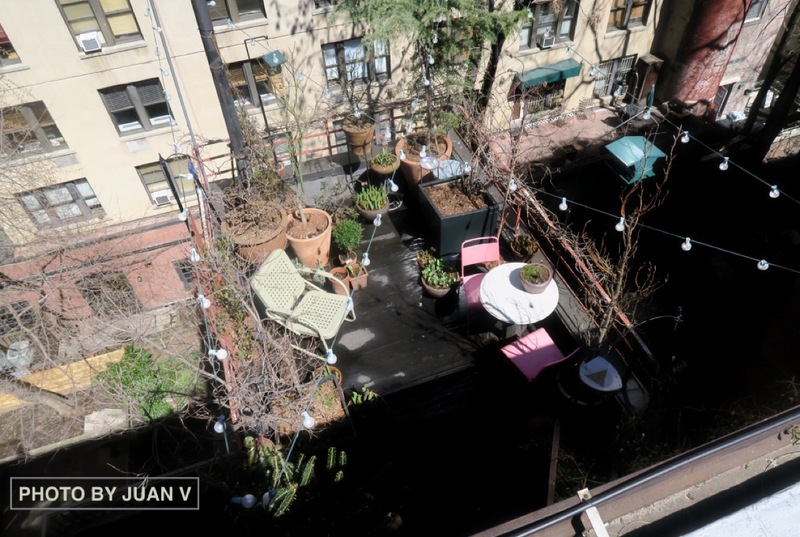 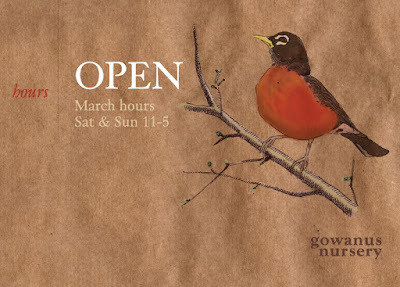 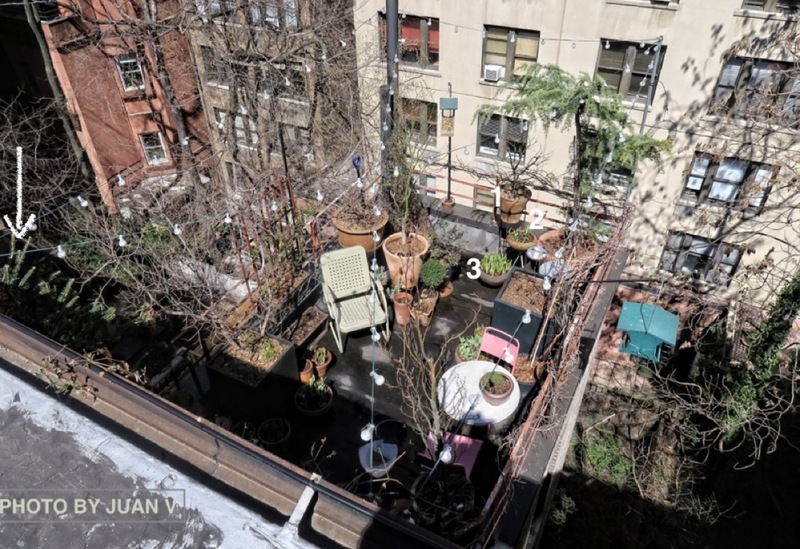 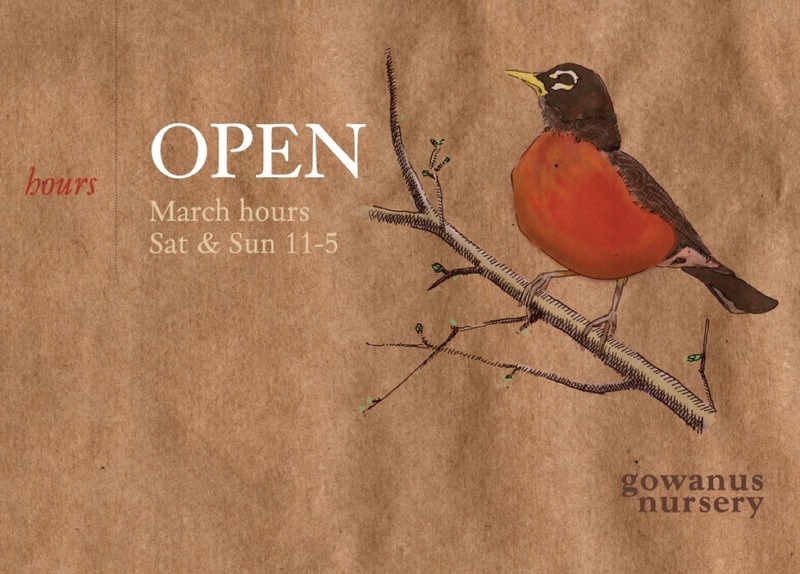 The image atop this entry is from the Facebook Page for Gowanus Nursery in Brooklyn. 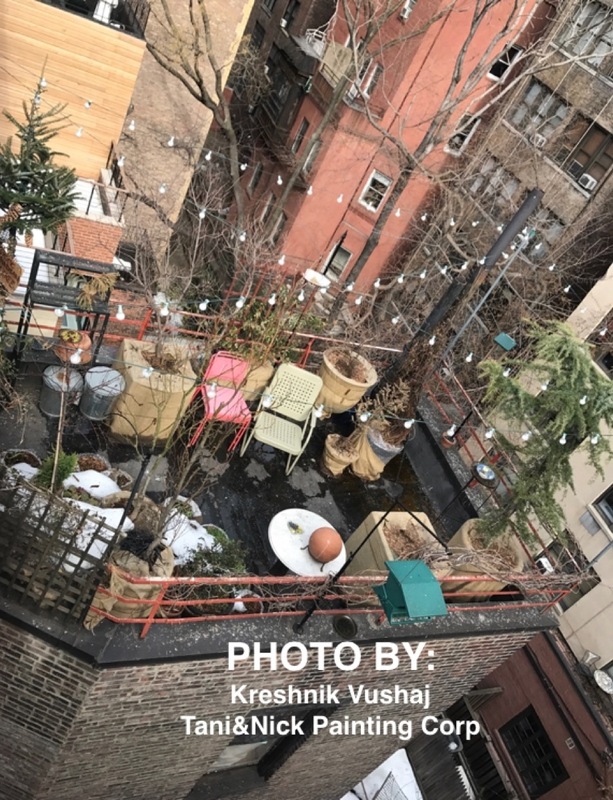 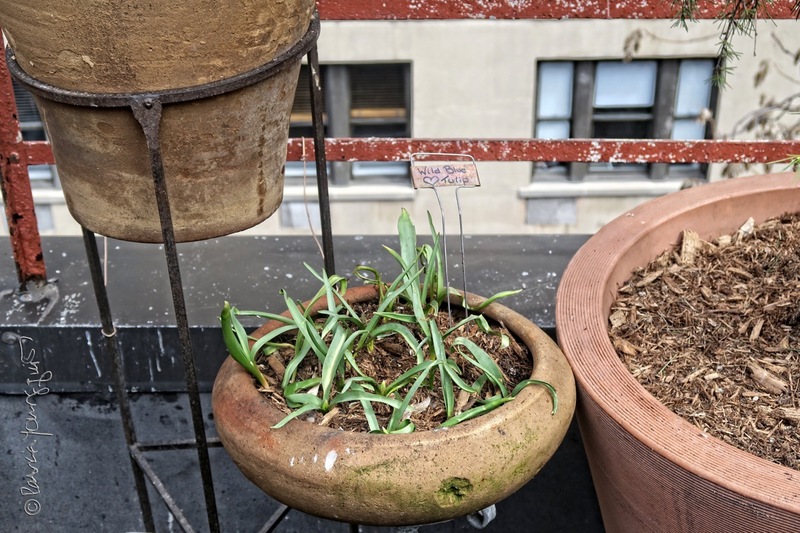 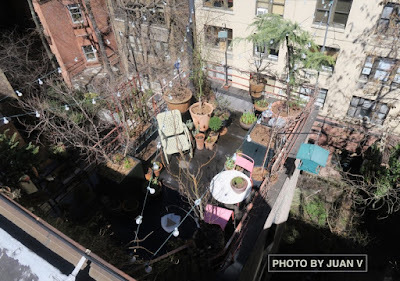 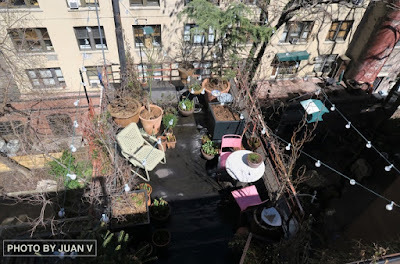 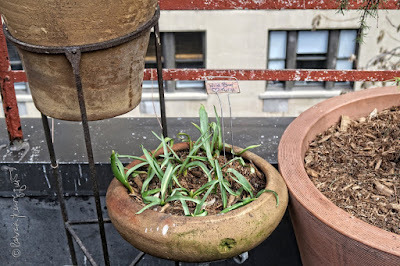 It is one of the places where I have gotten some of the flora that grows in my rooftop garden, which is something I mentioned in a post that I published here on Blogger on March 22nd, 2017.
as evidenced in a number of my entries here on Blogger. 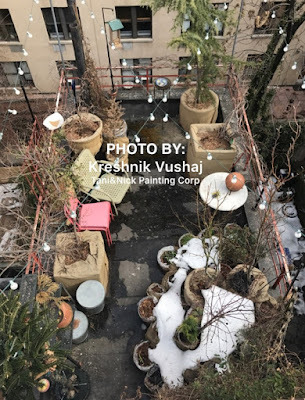 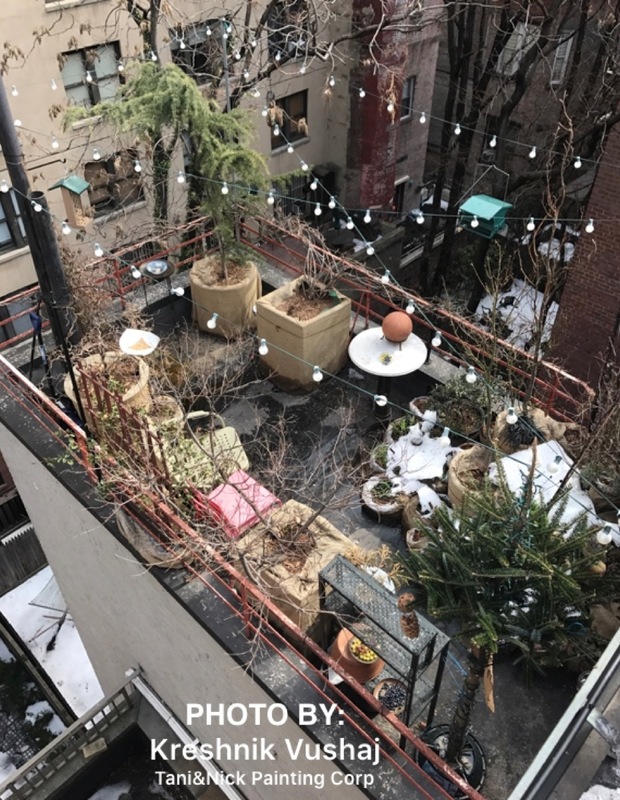 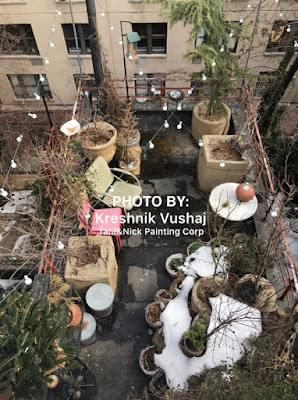 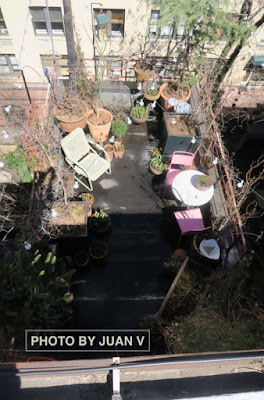 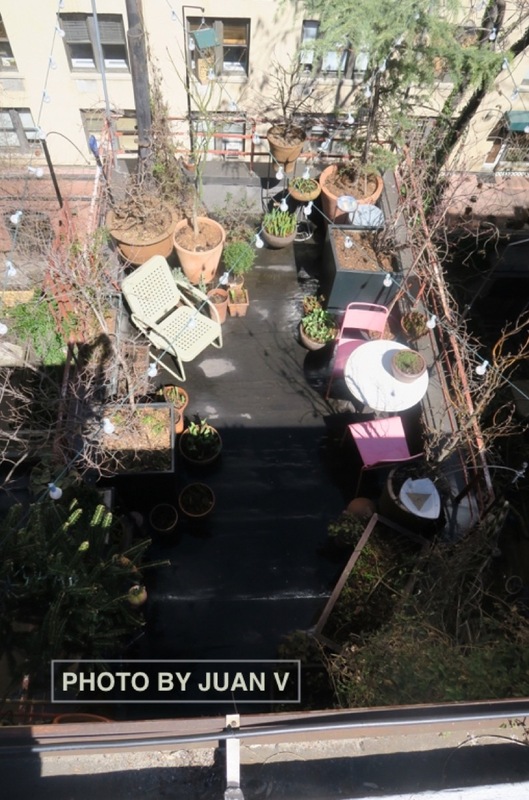 In any event in the aforementioned entry re Gowanus Nursery, I discuss the fact that they had to delay their opening on two occasions because of wintery conditions; and I also stated that I had to postpone my garden de-winterizing two times for the same reason. to illustrate the difference in my garden from last week to this week. 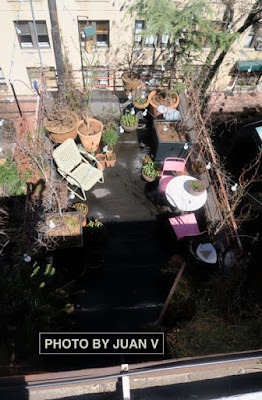 On this past Monday, I unwrapped all of my containers (which had been sealed with bubble-wrap as well as burlap for the winter). 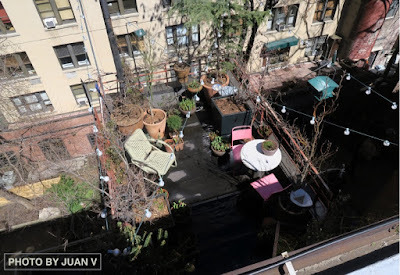 And, yesterday, Juan V came by to work his magic with flora pruning and plant placement; the results can be seen in the next pictures; which were taken by him. 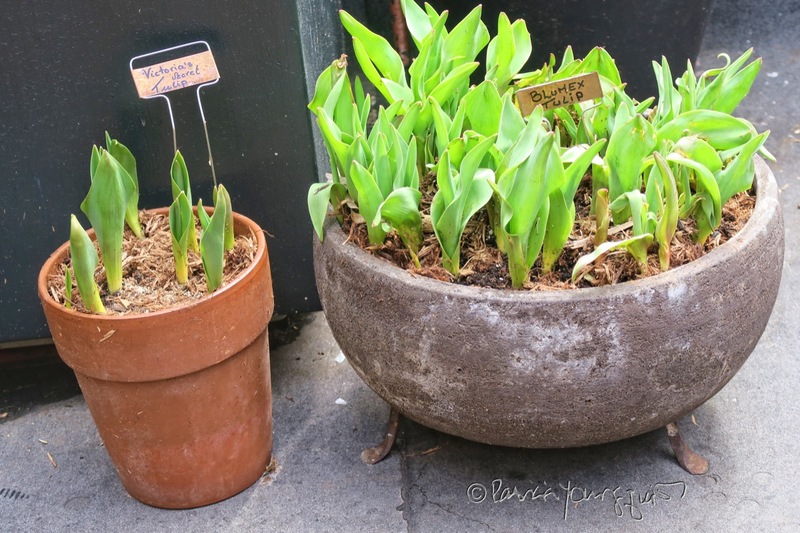 just eleven days ago in my post on Blogger (March 19th 2017). 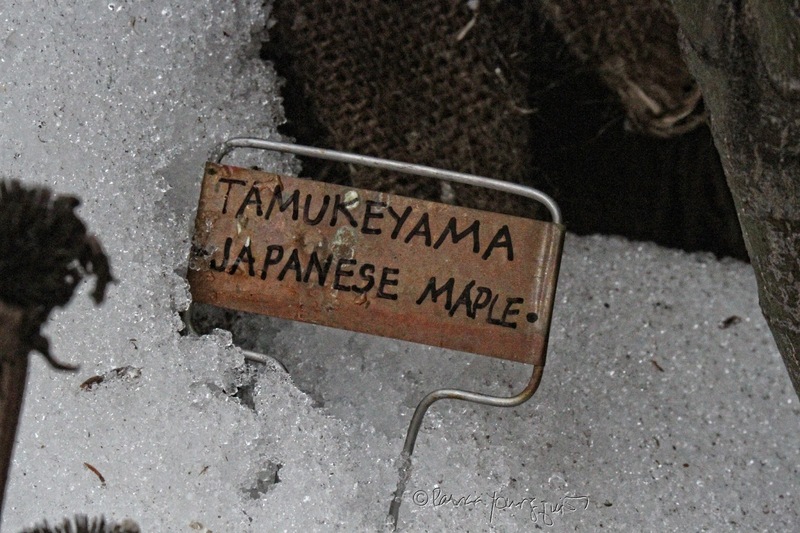 As you can see, my 'Tamukeyama' survived the winter, although its container has beginning to split in spite of the protection I gave it; and I will have to provide a replacement if I want the tree to thrive! 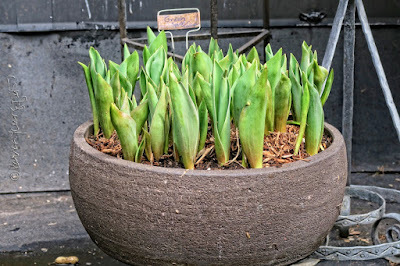 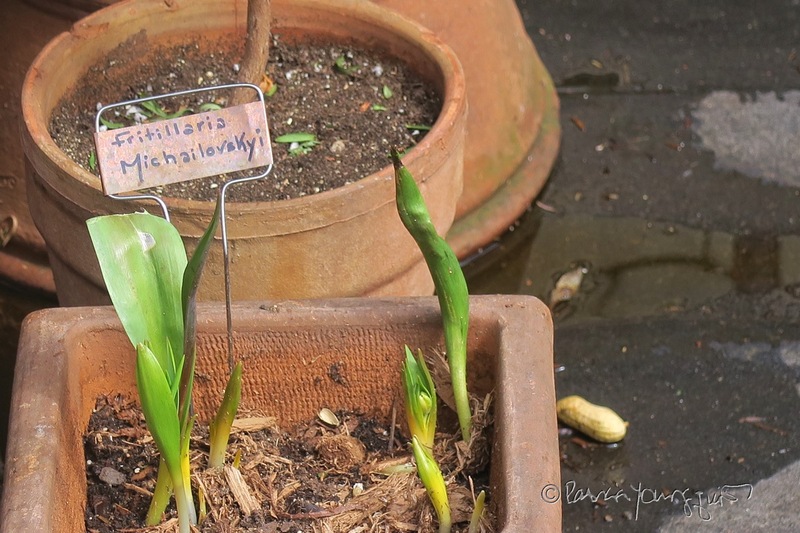 Meanwhile, to my 'Tamukeyama's' left, indicated by the number two, is a bowl housing my Wild Blue Tulips. 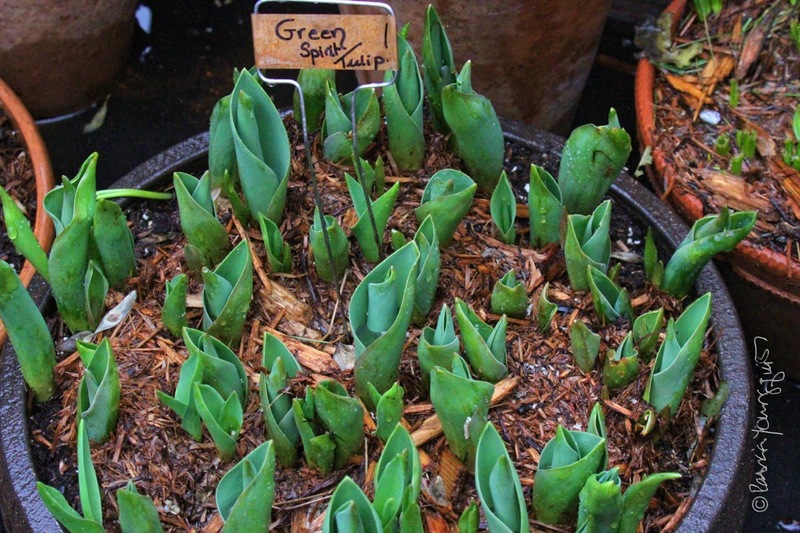 The following picture is a closeup of how this tulip type currently looks. 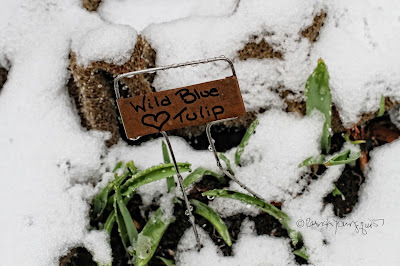 In any case, to the left of the Wild Blues, in Juan's image, I have my bowl of Green Spirit Tulips. Close-up images of this tulip variety can be seen in the next two pictures. like Juan's first image, the arrow, I've added references the location of my Canadian Palm Tree, which is a "flora-type," that I've discussed in a several entries here on Blogger. As for the numbers I've added to his image, the number one indicates a container where one of my crocus's varieties is growing. 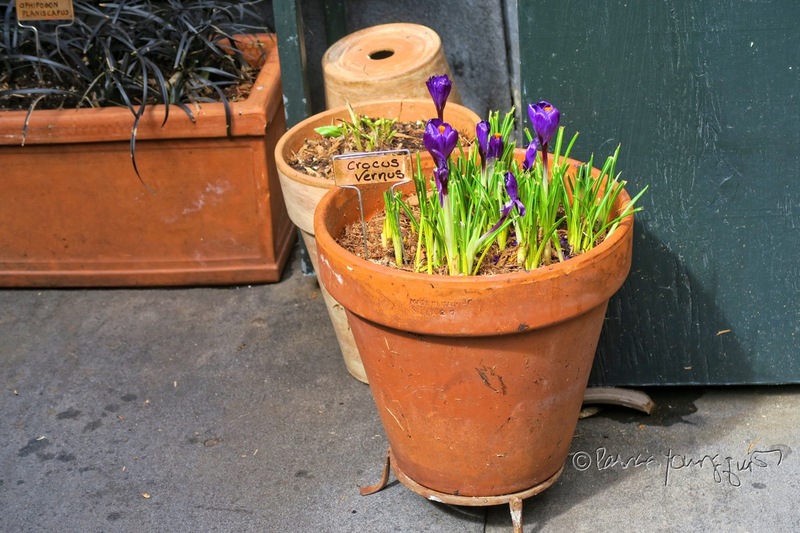 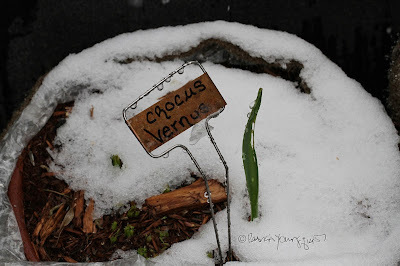 The name of the variety I am referring to is Crocus Vernus. in the March 19th blog post I've been referencing. 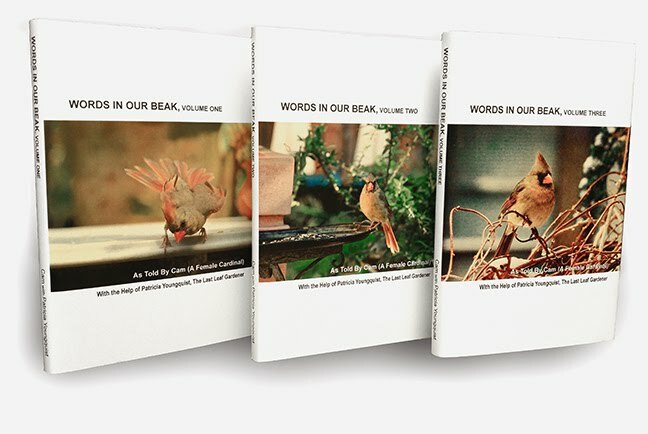 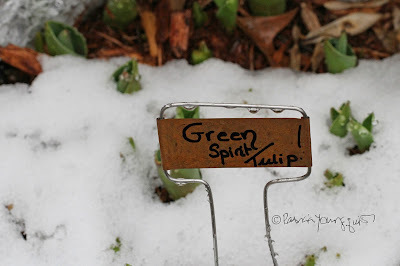 But getting back to my discussion re Juan's image where I've added numbers: Two is referencing a couple more of my tulip varieties whose names are Caribbean Parrot and Victoria's Secret; as seen in the following photo. and, hopefully they will flower! 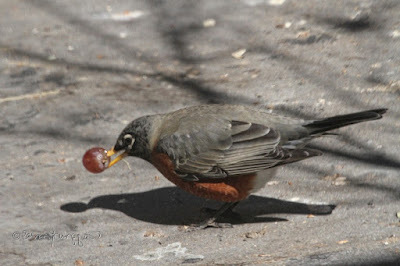 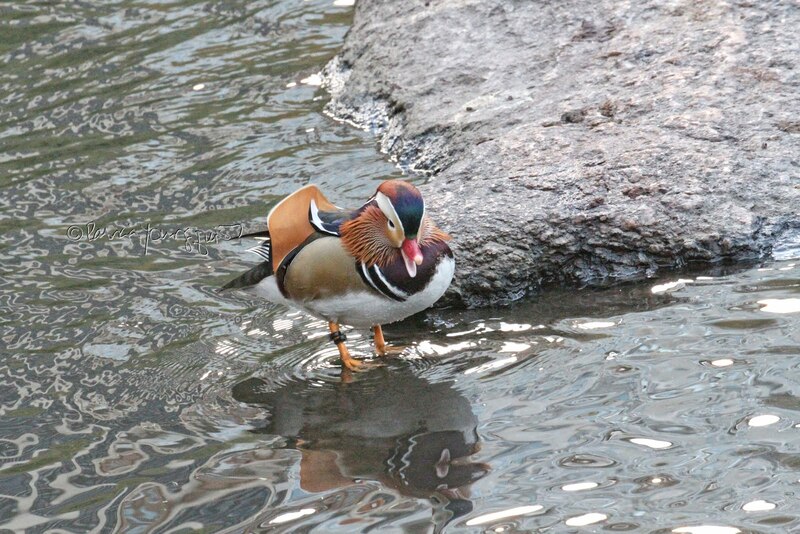 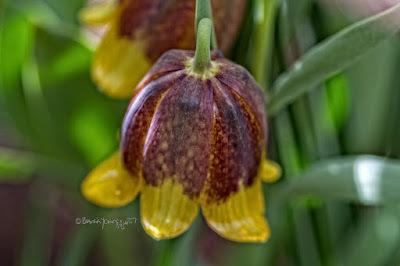 which was taken in my garden a number of years ago. Moving along to number four, this refers to an identical twin of my Victoria's Secret Tulip (discussed with the number two reference). 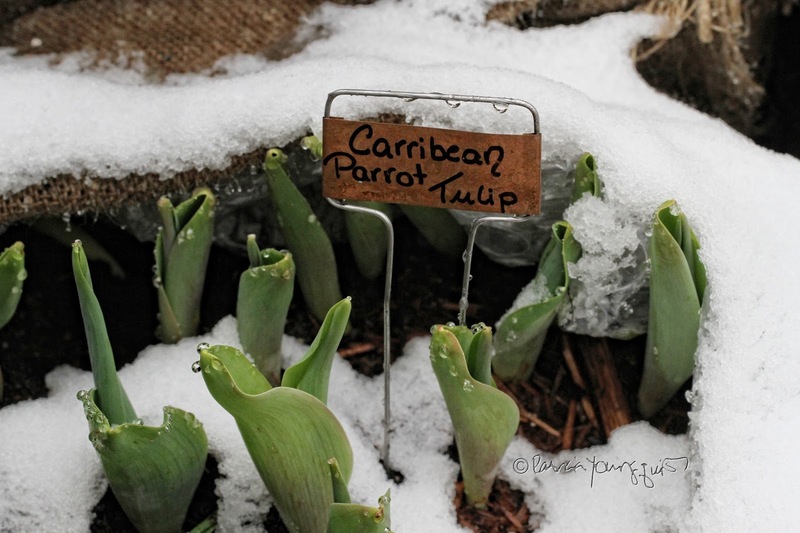 And number five is referring to my Parrot Blumex Tulips. 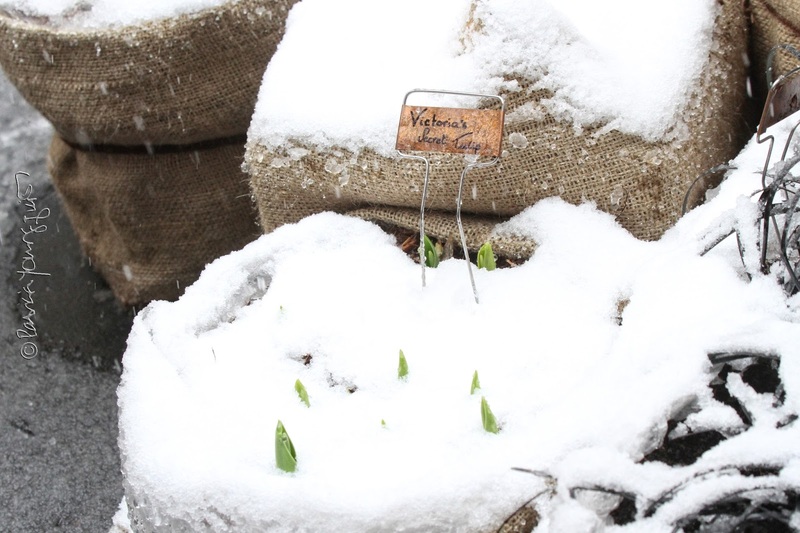 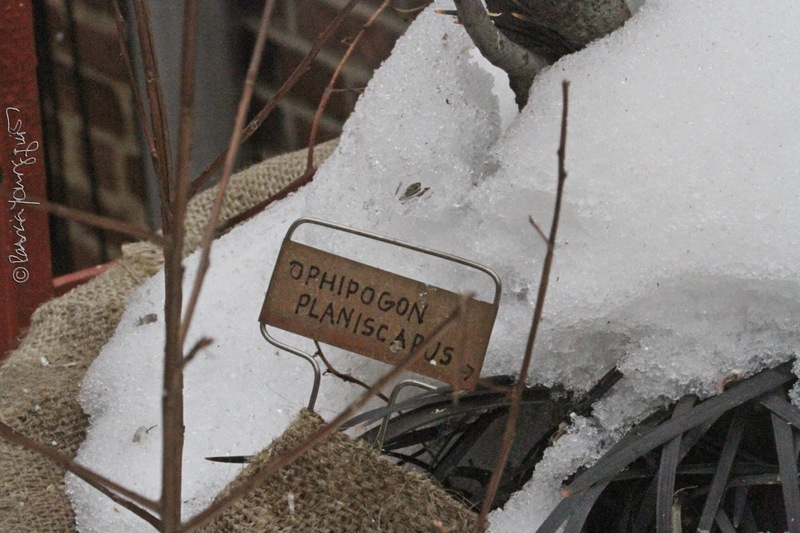 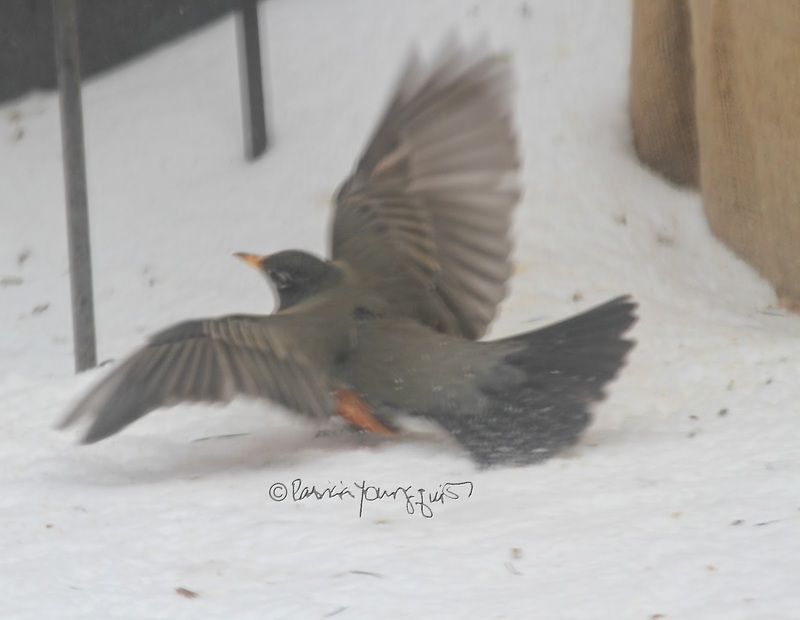 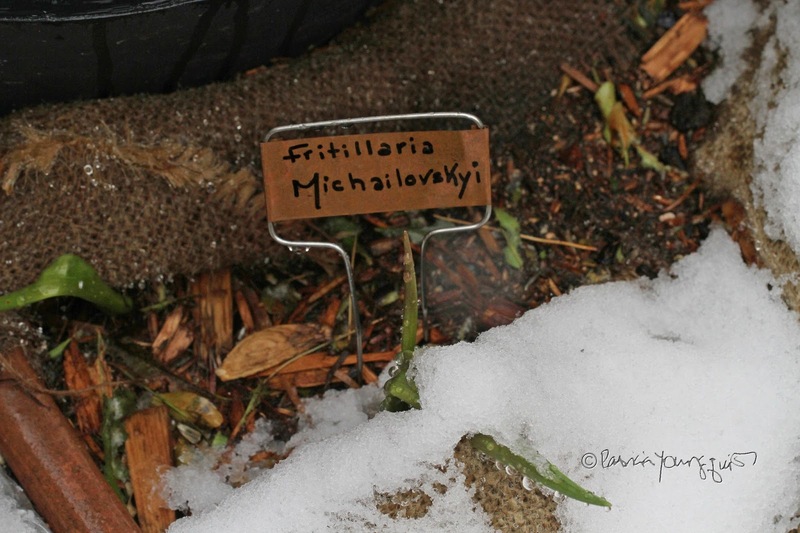 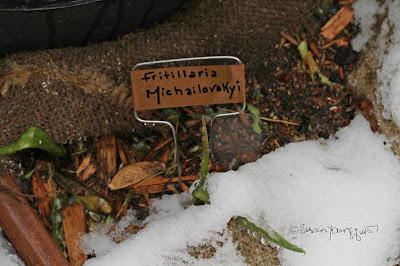 They were so under the snow that even their tags were covered; but hopefully they'll produce flowers anyway! 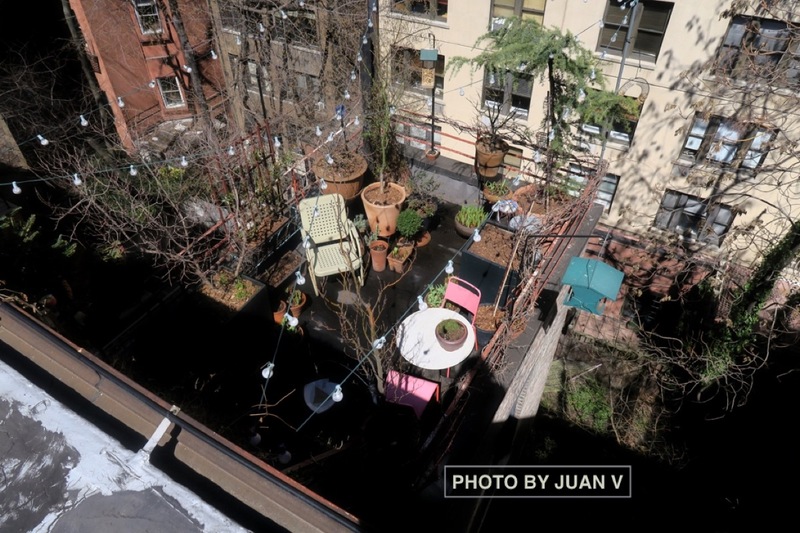 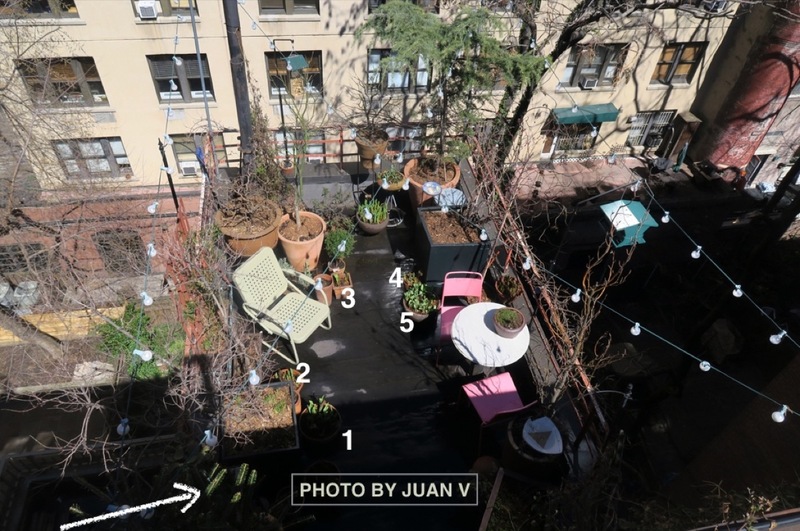 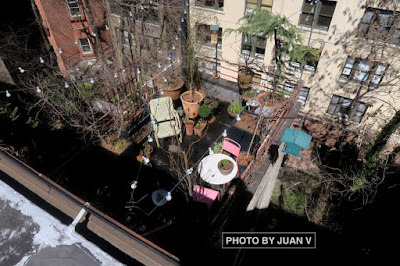 And with that dear reader, I'll conclude this posting by leaving you with a few more of Juan's aerial photos in the event you'd still like to explore my garden!